Finally! I have been eyeing this challenge over at CAS Watercolour and I finally had the opportunity to play along. I got out one of my all time favorite Verve stamps and my watercolors and went to work. I love working with these ornaments so much that each and every Christmas I have to make a card with them. The music background stamp never lets me down. ( It has no name on it so I don’t know who’s it is.) I added a few Nuvo drops and some sparkly bows from a Die-cut from Paper Smooches, some banners from MFT, and I was done. 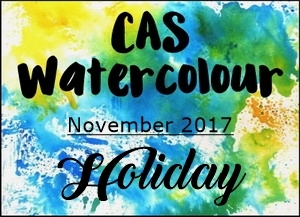 If you have not heard of the CAS Watercolour Challenge….You MUST go check it out! The team is super talented!!! What I also love about it, is it’s a month long! Categories: Cards | Tags: Card making, Cards, Christmas cards, rubber stamps, Verve Stamps, watercoloring | Permalink. Pretty card and great job with the watercoloring. Love the colors. Hope you had a wonderful Thanksgiving. Hugs, my friend. 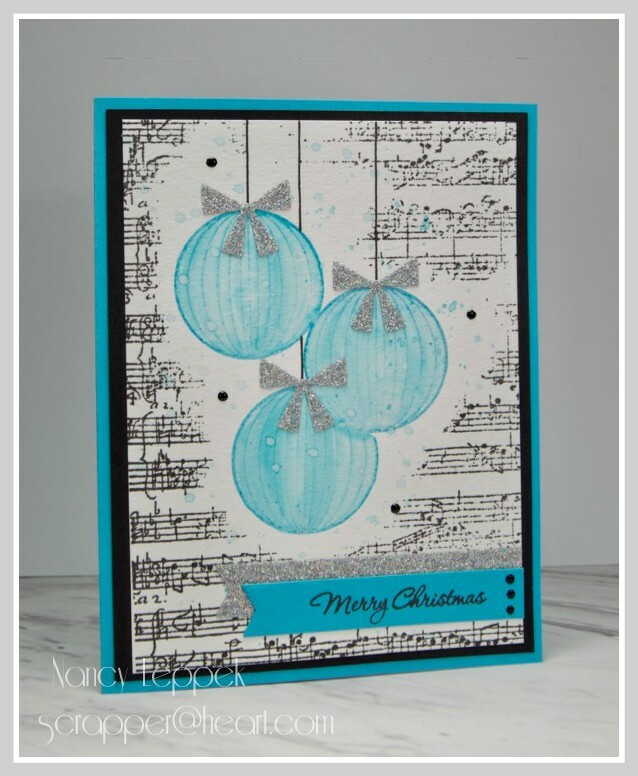 Your blue watercolored ornaments are so pretty nested in the musical background stamp. Lovely card, Nancy. Your son’s wedding pictures were so wonderful to see. TFS…. I suppose you are really missing him now. This is beautiful Nancy. Lovely background for those gorgeous softly coloured baubles. Love the blingy bows. Thanks for coming over to CAS Watercolour Challenge and joining in the November Challenge. Ina Guest Designer. What pretty holiday ornaments, Nancy! Thanks for sharing with us at CAS Watercolour! Pretty watercoloured ornaments, Nancy. Love the sparkle from the glitter bows. Thanks for sharing with us at CAS Watercolour! How did I miss this one? I love it all from the background to the glitter ornaments. Looks like a good one to make several of them quickly too. Love how you framed the icy blue with the black.